On Sunday, February 21, 2016 sixteen Minutemen traveled to Bristol Central High School for the regional qualifer to advance to the State Tournament in New Haven on February 28th. There was plenty of stiff competition as teams from Bristol, Cheshire, East Hartford, Enfield, Meriden, Newington, Plainville, Rocky Hill (KT Kidz), Simsbury (FishEye), Somers, Southington, South Windsor, Suffield (Warriors), Thomaston (CT Green Knight) , Wethersfield and Winsted (Hurricane) all showed looking to qualify. The Intermediates were led by Cayden Hill at 80 lbs and Nicky Ebrahimi at 95 lbs with first place finishes. Also qualifying were Julian Shaw 95 lbs 2nd place, and Hiram Sepulveda 87 lbs., 4th place. Wrestling tough on the day in the Intermediate Division were Austin Teti, Davian Rodriguez, Mason Arborio, Elijah Ortiz, Mason Hill, Aiden DeJesus and Conlan Simard. In the Novice Division the Minutemen had three entries and all three advanced as JoJo Gonzalez in his first year of wrestling placed 2nd at 80 lbs. Johnny Rosario placed 2nd at 112 Lb. and Landon Vieira placed 3rd at 85 lbs. in one of the toughest weight classes in the entire tournament. In the Middle School Division Sebby Gabor placed 2nd at 190 lbs while Vinny DeFrancesco placed 5th just out of qualifying afer lossing in Over Time 8-6. So half of the Minutemen who wrestled will via for a State Title next weekend. Southington High School was the site for a Beginner Tournament on February 7, 2016. A good size group attended with very good results. In Mighty Mite Jaylen Gonzalez – won 1st place. In Bantam Nivmaly Rios placed 4th place. In the Intermediate Division Jack Jortner and Batu Kayaarasi placed 4th place, Hiram Sepulveda, Davain Rodriguez and Mi’Anjel Velazquez all finished 2nd place. Richard Bennett competing in the Novice Division finished 2nd place and wrestled well. In the Middle School Division Marshall Alleyne took 4th place. Coach Mark Mangiafico said about Jaylen Gonzalez's wrestling, "While they were all Mighty Mites, the wrestling was pretty good and Jaylen was dominant his bracket. Everyone showed marked improvement since the beginning of the year." A small group traveled to Westhill High School on Sunday, February 14, 2016 to compete in the Mighty Mite and Bantam State Tournament. The Minutemen came away with one champion as Jaylen Gonzalez took first place. Maleeah Rios placed second, Gunnar Rumpf took third and Tyler Ebrahimi finished 4th . "For Tyler and Jaylen this was their first year of wrestling, so they came a long way in two months, said Head Coach Roger Moss. He went on to add, we are very proud of all four wrestlers who represented the Berlin Minutemen well all year long." South Windsor High School on Sunday January 31st, 2016 sixteen Minutemen took to the mats and wrestled for gold. Those winning gold were Maleeah Rios, Nicky Ebrahimi and Vinny DeFrancesco. 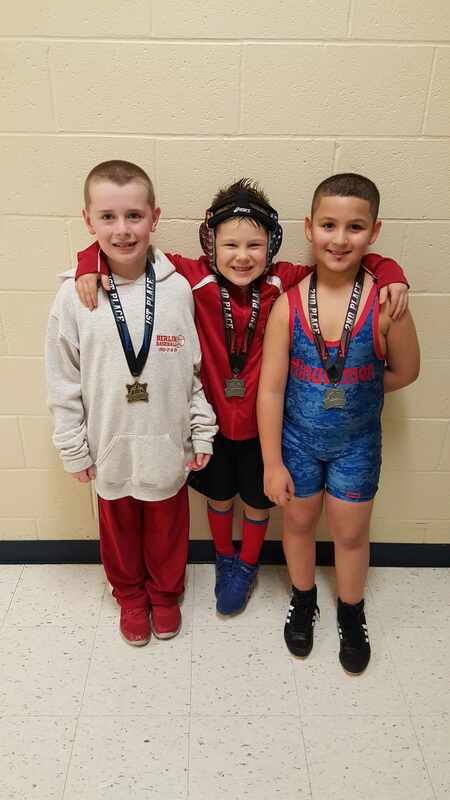 The lone Mighty Mite Tyler Ebrahimi took 2nd place and in the Novice Division Johnny Rosario took third. 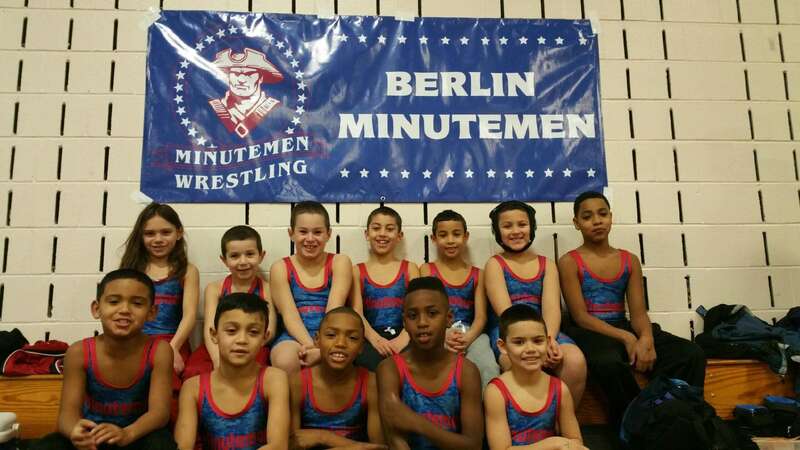 The largest group of Minutemen were the Intermediate Division with 10 wrestlers entered. Placing second were Eli Ortiz, Mason Hill, Aiden DeJesus and Mi'Angel Velazquez. Third place finishers were Austin Testi, Cayden Hill and Julian Shaw, while fourth place finishers included Intermediate Davian Rodriguez, Hiram Sepulveda; Novice Division Landon Vieira and JoJo Gonzalez. Head Coach Roger Moss said, "We saw a lot of good competition today with wrestlers from New York and Massachusetts as well as Connecticut. We have been working hard in practice and those that work the hardest are seeing great success in the tournaments." Ten Minutemen traveled to Ledyard High School on Sunday, January 10th, 2016 to test their skills. 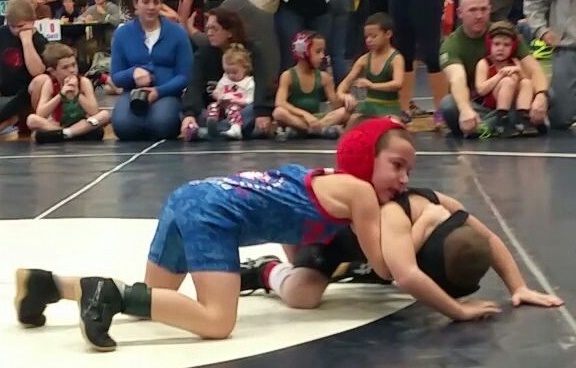 In the Mighty Mite Division Tyler Ebrahimi won two matches by pin and took first place. In the Bantam Division Ayden Rodriguez won three matches by pin and a 10-2 decision to take first. In the Intermediate Division Mason and Cayden Hill both went 3-1 to place 2nd, Mason Aborio and Nicky Ebrahimi both took 3rd and Davian Rodriguez, Aiden DeJesus and Julian Shaw wrestled tough on the day but finished out of a medal. Lone afternoon Novice wrestler Landon Vieira wrestled tough and took third. Coach Dan Harding said, "We showed some great progress on the mat today and are really starting to execute the techniques we are teaching in practice. If they keep coming to practice on regular schedule they will be ready for the State Tournament at the beginning of March." 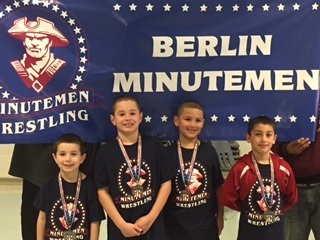 Sunday January 10, 2016 at Jack Jackter Intermediate School, Colchester CT nine Minutemen traveled through the rain as temperatures hit a record 59 degrees to compete in the beginner tournament with outstanding results. In their first tournament ever Conlan Simard (Intermediate) and JoJo Gonzalez (Novice) both took first place with three wins. Jaylen Gonzalez (Mighty Mite), Gunnar Rumpf (Bantam) and Hiram Sepulveda (Intermediate) placed 2nd. Richard Bennett in the Novice Division placed 3rd and roudning out the group Nivmaly Rios (Bantam) and Marshall Alleyne (Middle School) placed 4th. CT Green Wrestling Tournament took place at THOMASTON HIGH SCHOOL on SUNDAY January 17, 2016. All wrestlers were grouped by age category weight and SKILL LEVEL into 5 or 4 ­man brackets. The Minutemen had great results with Tyler Ebrahimi, Maleeah Rios, Mason Aborio, Elijah Ortiz, Aiden DeJesus and Nicky Ebrahimi all placing first. Finishing third in their respective weight classes were Davian Rodriguez and Landon Vieira while Ayden Rodriguez, Austin Testi and Hiram Sepulveda all finished fourth. On Sunday January 24th the snowstorm had stopped and wrestling was on at Somers High School in Somers, CT. Not oly did the Minutemen weather the storm but they made a statement on the mats with outstanding results. 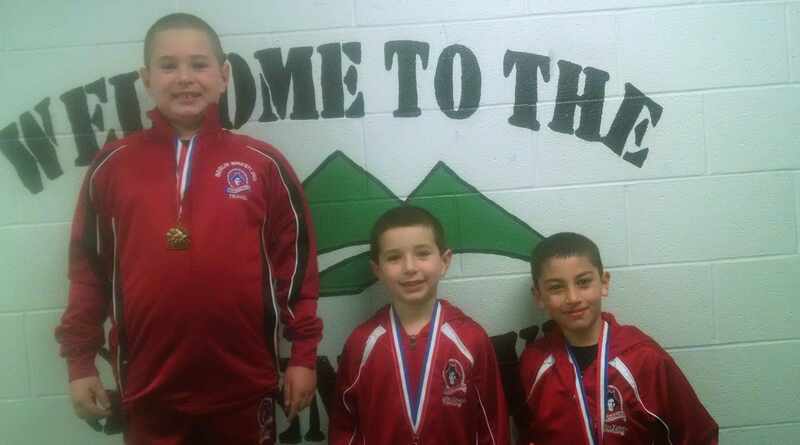 In the Mighty Mites Division Tyler Ebrahimi continued to improve losing a close match 9-8 but finishing 3rd on the day. In the Bantam Division Ayden Rodriguez finished 2nd and Maleeah Rios brought home a Bronze medal. The largest group of the day wrestled in the Intermediate Division where Nicholas Ebrahimi and Julian Shaw both won Gold, Davian Rodriguez and Cayden and Mason Hill all finished 2nd. Third Place finishers included Hiram Sepulveda, Aiden DeJesus and Elijah Ortiz. Colin Peck wrestling in his first tourament of the year wrestled in a tough bracket and showed great signs for success in the future as he finished fourth. The after noon had two Novice wrestlers finishing second as Landon Vieira and Johnny Rosario wrestled tough for silver. Coach Fred Orde summed it up with, "We have missed some practices due to school events but those who show up to every practice are really starting to click on the mat. I love when a kid does a move we have been working on in practice with success, it really makes me smile." Click on this link to see pictures that Coach Dan took: https://goo.gl/photos/HKLJw4ChxmSvU9BY7. 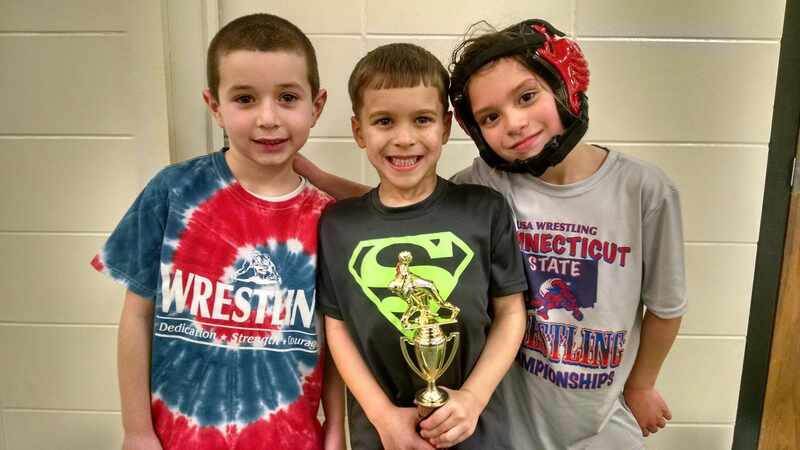 On Sunday Jan. 3, 2016 a group of Minutemen were eager to get back on the mats after the Holiday Break and traveled to Southington for the SharkFest. The lone Mighty Mites wrestler Tyler Ebrahimi finished 2nd with a close 5-4 win in his final match. In the Bantam Division Ayden Rodriguez returned to the mat after missing the start of the season and lost his first match 8-6 before winning the next two to place 2nd. The Intermediate group was the largest on the day as Julian Shaw placed 2nd, Eli Ortiz placed 3rd and Nicholas Ebrahimi and Hiram Sepulveda both finished 4th. The afternoon session had first year Novice Richard Bennett wrestler working hard after only a month of wrestling and finishing 4th. Marshall Alleyne in the Middle School Division wrestled tough but also finished 4th on the day. Coach Mark Mangiafico said, "I was really happy with today's effort considering we have not practiced since December 22nd since school has been closed. We will get back to the mats and I know these young athletes will only get better." Today Nicky wrestled in a 3 man bracket he won his first match and then got pinned by a Norwalk wrestler (he fought so hard he threw up coming off the mat). Tyler lost both his matches (he was also in a 3 man so he took bronze). Eli was in a 4 man and in his last match went to sudden death but he ended up losing all 3 matches. The Minutemen traveled to Bristol Eastern for the second tournament of the young season. The twelve morning wrestlers had a good day on the mats bringing home many medals. The individual results were; Mighty Mite Tyler Ebrahimi went 3-1 to place 2nd, Bantams Nivmaly and Maleeh Rios both placed 4th, the largest group of wrestlers were the Intermediates with Austin Testi and Nicky Ebrahimi placing 1st, Elijah Ortiz, Mason Hill, Julian Shaw placing first and Mason Arborio, Cayden Hill, Mi'Angel Velazquez, Hiram Sepulveda all placing third. For Velazquez and Sepulveda this was their first tournament ever. In the afternoon session there were two Minutemen who competed in the Novice Division. Landon Vieira placed second and Johnny Rosario placed 3rd. The coaches on the day were Dan Harding, Mark Mangiafico and Roger Moss who all were pleased with the efforts of the group. Coach Harding said, "I was impressed with Landon's performance today. He was trying to use a leg move that we had just taught him on Friday so it was good to see his effort. He really has come along nicely so far this season." Coach Moss added, "I think one of our most improved wrestlers today was Elijah Ortiz. He was in a tough bracket and never gave up. He improved on the mat and medal stand over last week." A small group of Minutemen traveled to New Milford High School on Sunday, December 13th for the Kick-Off Classic Wrestling Tournament. The group wrestled extremely well on the day with the following finishes; Tyler Ebrahimi in his first tournament as a Mighty Mite placed 2nd with three wins two my pin, Bantam Maleeah Rios finished three and one on the day but took first on a point criteria as she pinned two of her opponents, Elijah Ortiz in the Intermediate Division finished 2nd with a 2-2 record pulling out a third period win in his last match to beat his opponent 5-3 and fellow Intermediate wrestler Nicky Ebrahimi won both his matches by pin to bring home a gold medal. In the afternoon Novice wrestler Johnny Rosario won one match on the day in a six man bracket. Head Coach Roger Moss said, "We have only been wrestling for about a month and have missed numerous nights due to school activities but they looked good as a whole and we now know some of the areas we need to work on to get better on the mat." Assistant Coach Fred Orde added, "I liked the aggressiveness of some of our wrestlers today, they went right after their opponent and won the matches. 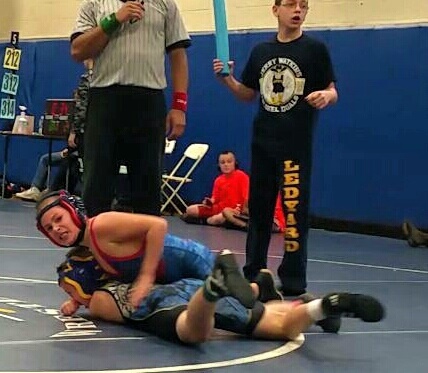 Tyler went out and won his first match ever by pin which was awesome." Berlin Youth Wrestling practices on Monday, Wednesdays and Fridays at McGee Middle School in Berlin. They are still accepting new wrestlers for those interested in joining the team. Visit their website at www.berlinwrestling.com or calling Coach Roger Moss at 860-828-9818.